John Ronald Reuel Tolkien, CBE FRSL (/ˈtɒlkiːn/;[a] 3 January 1892 – 2 September 1973) was an English writer, poet, philologist, and university professor who is best known as the author of the classic high fantasy works The Hobbit, The Lord of the Rings, and The Silmarillion. He served as the Rawlinson and Bosworth Professor of Anglo-Saxon and Fellow of Pembroke College, Oxford, from 1925 to 1945 and Merton Professor of English Language and Literature and Fellow of Merton College, Oxford, from 1945 to 1959. He was at one time a close friend of C. S. Lewis—they were both members of the informal literary discussion group known as the Inklings. 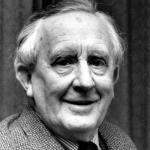 Tolkien was appointed a Commander of the Order of the British Empire by Queen Elizabeth II on 28 March 1972. Tolkien also translated the Book of Jonah for the Jerusalem Bible, which was published in 1966.